Hello! My name is Melanie and I'm the Work At Home Mom (WAHM) behind Little Bo-Peep Knits. 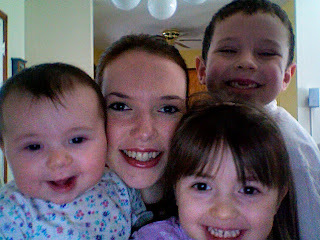 The above picture is me and my clan hamming it up for the webcam. lol My children are my life and everything I do is for them. I've been married to my husband for 12 years and we live in Virginia with our 2 dogs that we rescued from the pound. I've always been "crafty", ever since I was a little girl. I used to love going to the craft stores with my mom and walking up and down the aisles dreaming of what I could create. I did the normal kid crafts of finger painting, coloring and molding with playdoh but even at the young age of 8 I was doing cross stitch. In my teen years I took on tole painting, basket weaving, cake decorating (still to this day I hate birthday cake! lol), beading and flower arranging. When I had my children I decided to use cloth diapers. My oldest daughter couldn't wear the plastic pants without getting a heat rash so after some investigating I found out that some people use wool covers. I thought "WOOL?! What kind of maniac does THAT?!" But after doing a LOT of research I realized that it really is the better choice for diaper covers and taking care of wool isn't as difficult as I thought. I'm the type of person that sees something and thinks to herself "Oh I can do that myself". So when I was in the market for wool covers I decided to teach myself how to knit these nifty little creations. In my internet travels I got tons of compliments on my work and people would tell me I could sell them and encouraged me to do so. Then, while searching for lucious yarn to knit with, the same thing happened! I thought to myself "I can dye my own yarn!" and so I did. Again, people loved what I created and asked if I would sell it to them. With the full support of my family I opened a business. I needed a name, though. One day I was thinking out loud and I said to my family "It needs to have something to do with sheep and kids" and my son piped up "Little Bo-Peep!" and that's how Little Bo-Peep Knits was born!